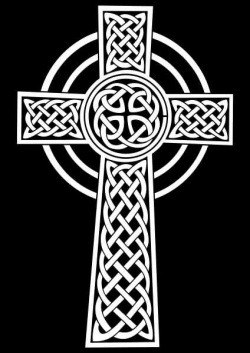 As you may have already noticed, I included not only a section on Christianity but also one on it's denominations simply because there are so many. That said, I'll give you a sort of crash course here so you can get the main idea that all the denominations build off of. 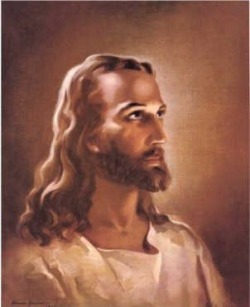 Christianity is based on the life and teachings of Jesus Christ. Though some among us dare to question his wide-spread visualization as a Jewish blond-highlighted surfer, that is indeed meant to be Him in the picture above just so you can get an idea. Christians believe that Jesus' mom was a virgin named Mary and that He was actually God incarnate who came to die for the sins of the world. Why was such a thing necessary you ask? Glad you did, allow me to explain. According to Christian doctrine, God made people so that He could love them and be loved by them in return. But alas, leave it to humanity to screw it up. You see God knew that love can never be forced, so He had to offer his new creations free will. So, smart as He is, He decided to keep the terms simple. He gave the first humans he created, a guy and girl named Adam and Eve (respectively pictured here) a gorgeous garden to live and romp freely through. But He had to give them a way to prove their loyalty and love to Him, so He put up a tree and told them not to eat of it's fruit, but other than that they were free to frolic the fields, naked I might add, as jaybirds. And so free will was born in it's purest form. But, alas, even this proved too much for poor Adam and Eve. Also pictured on the right you may notice a sneaky snake. Christians believe that's Satan (God's enemy) incarnate. As the story goes he convinces Eve, who then convinces Adam, to eat from the shiny, tasty looking fruit. Not the first time one of us women was tempted to eat something we weren't supposed to, but in this case I hope for Eve's sake that that was one helluva bite. For due to it, our initial trust with God became tainted because this was the first time we had ever sinned (did something that didn't cooperate with God's plan). And God, unfortunately, cannot handle the presence of sin so poor Adam and Eve were cast out of the garden. And so, what was God to do? Humanity had chosen a path He couldn't be a part of and so separated ourselves from Him and His love. Christians believe that God was distraught to say the least and set about to find ways to reconcile Himself with humanity. Eventually He worked out a system, which can be found in the Old Testament of the Bible. The basic idea was that there would be a set of laws, and lots of them, that humans would follow. And those who did would stay clean from the sin and therefore able to come into the presence of God. 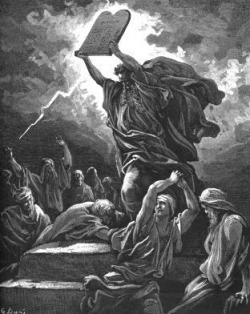 On the left is a picture of Moses holding some of these laws and you can tell from the ominous lightning striking about the people exactly how well that plan worked out. However the law prepared for this too and worked out a system where if you sinned you could simply sacrifice an animal who would pay for your sin with it's life. Clearly this was not a great time in history to be a lamb. Although this system did work out fairly well for the people who adhered to it, it was very complex and difficult. This is where Christians believe God came up with the plan that would found their religion. As the Bible has it, God spent much of the first few centuries of humanity hoping for the best. Hoping that peope would do what they were supposed to, or adhere to a set of laws, or just be good enough to be worthy to call themselves His children. As it turned out though, we as a people are not too quick to please. However followers believe that just at the point where God probably should have just wiped us out, He instead decided He still wanted us, flaws and all. So He set about devising a system that would abolish the law and sacrifice system forever, one where people could have a relationship with Him no matter how good or bad they were. One where instead of being required to follow laws, followers would first start with a relationship with Him, which in turn would help them grow into the type of people who are what they are supposed to be. But the problem of sin remained and could not just be ignored. Someone had to pay the price. So God began to consider the various sacrifices and tried to determine whether there was one so large, that it would cover everybody's sins forever. As it turned out there was a solution but it wasn't pretty. 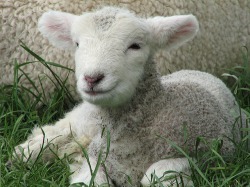 No mere lamb would do. Not even a flock of them, nor any other animal, no not even the life of a man. The only life that would purchase the souls of humanity forever was the life of a God; His own. And so as the story goes, God chose a very special woman named Mary who was a virgin and gave her a son named Jesus, who Christians believe was God incarnate. This is a bit confusing to many people. Was Jesus God? Most Christians will say the answer is yes, He was one of the three parts that make up God. Huh you say? Well, as the Irish put it, imagine a clover. It has three leaves, yet is all part of the same plant. So it is with this set up. Christians believe God is three separate parts, that make up a whole. And so God sent this part of Himself to earth and for 33 years Jesus preached a new gospel, one of love and compassion for our fellow man. And at the end of that 33 years, humanity killed him by nailing Him to a cross where he hung and bled until he died and so bought the right to the souls of all humanity.